HD is in high demand these days. It's only natural to want everything in sharp focus. But what about health in HD? 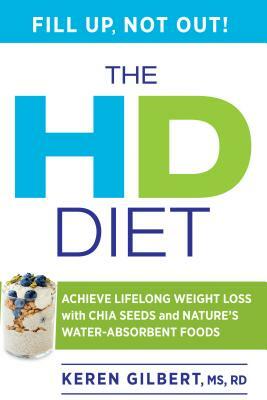 The HD Diet shows readers how to choose the right foods to ensure a high-definition life. This 12-week plan provides guidelines on incorporating hydrophilic ("water-loving") foods like oats, beans, artichokes, spinach, and apples, along with nutrient-dense hydro-boosters like chia seeds, into a well-balanced diet. When digested, these foods diminish cravings, maintain digestive health, and encourage weight loss. Keren Gilbert also encourages readers to phase out "IF" foods—infrequent foods such as white bread, processed foods, and refined sugar. Readers will find delicious recipes like Cinnamon-Chia Oatmeal, Scallop Stir-Fry Shirataki, and Pumpkin Yogurt Parfait. The HD Diet focuses on a mind-body approach to weight loss that is both pleasurable and sustainable. With motivational stories from clients (some have lost up to 30 pounds in 12 weeks), detailed shopping lists, daily menu templates, and a strong emphasis on making healthy decisions for life, The HD Diet ensures that every reader will live life in high definition. Keren Gilbert, MS, RD, is the founder of Decision Nutrition, and has been counseling patients since 1998. She holds a master's degree in nutrition and food studies from New York University and completed her dietetic residency at Mount Sinai Hospital in New York City. She has been featured in Self, Shape, Redbook, US Weekly, and on Fox and Friends, among others. She lives in Roslyn Heights, NY.